The fallout from the SNB decision last week to abandon the EURCHF 1.20 ceiling on the CHF and let the CHF appreciate continues, with talk of far tighter regulation on retail FX and reviews of risk management systems in the wake of industry wide loses that may yet top $10bln. 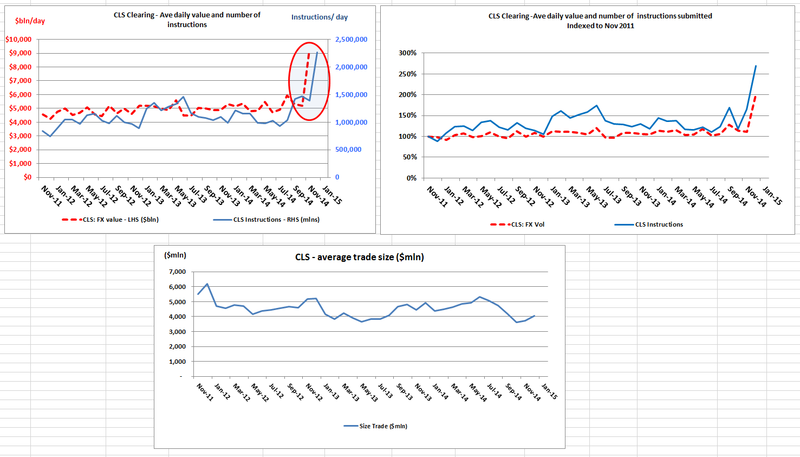 In terms of FX volumes on ‘black Thursday’, FT Alphville has an article stating some volume figures from CLS (the wholesale FX settlement system). Plugging those into the data I track, we see that last Thursday’s volumes blow away previous FX records with daily volumes surging to a new record of $9.2trillion/day up 78% from the $5.17trillion/day seen in last reported period of Nov 14, and some 55% higher than the previous record being $5.94trillion/day set in Sept 14. The surge might also partly reflect the reduced ability/willingness of the large firms to internalise flows, which would not be surprising given the volatility. The number of transactions submitted for settlement, also rocketed 63% higher to 2.26mln up from 1.38mln in Nov 14, and some 50% higher than the previous record of 1.465mln set in Oct 14. Interestingly, the average trade size increased by 9% from $3.73mln in Nov 14 to $4.07mln, possibly reflecting the fact that less was executed using algorithms electronically.